The Phoenix Low Voltage Thermostat is designed to provide remote or onboard thermostatic control to the Phoenix FireBird Heat Drying System. The Phoenix Low Voltage Thermostat is now included with the purchase of a FireBird Heat Drying System, as well as sold separately as a retrofit to your existing FireBirds. The device is built with a robust, stainless steel bulb style sensing element packaged in a durable, ABS enclosure. 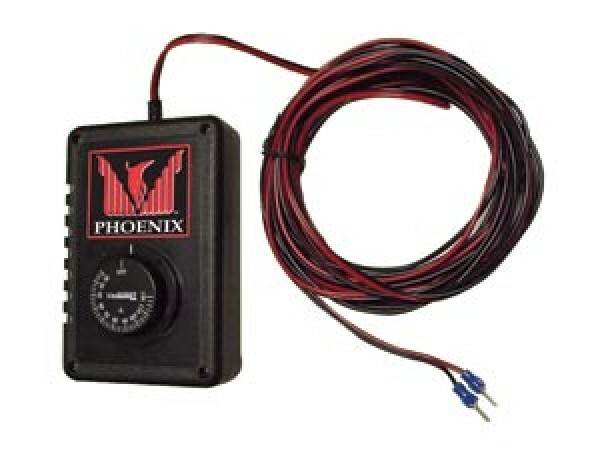 Phoenix provides a 25 ft cord, which can also be extended with any common thermostat wire. The Phoenix Low Voltage Thermostat is able to control within the temperature range of 32° to 122° F (0° to 50°C). The range and durability of this control makes it the perfect companion to the Phoenix Firebird for many applications including high temperature drying, emergency backup heat, and freeze protection. The Phoenix Low Voltage Thermostat can also be used in many low voltage HVAC applications that use dry contact closure for temperature control.